JUBA, South Sudan (CNS) — Already facing a shortage of priests, the Catholic Church in the world’s newest nation has closed a portion of its seminary, leaving dozens of young men stranded on the road to the priesthood. When classes start at the end of October at St. Paul’s Major Seminary in Juba, only 64 students will be present. They are in the final two years of theological studies and have been transferred from Khartoum, the capital of Sudan, from which the South became independent in 2011. 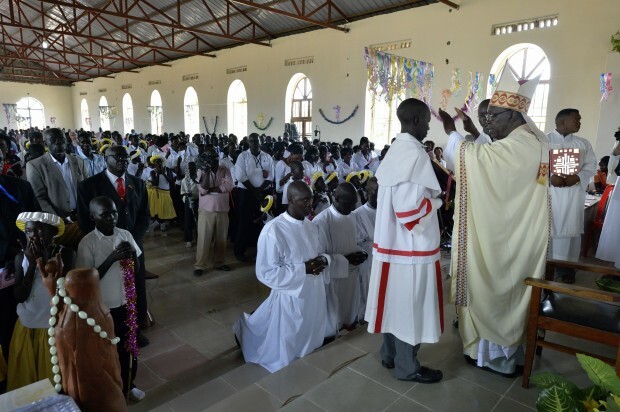 Given growing harassment and repression of southerners and Christians in the mostly Islamic North, church leaders decided to move the students to Juba. Most of the seminarians are from South Sudan anyway, and seminary officials were worried they would not be granted visas if the seminary continued to operate in Khartoum. “With our independence, (Sudan’s President Omar) al-Bashir got very angry, and life became even more difficult in the North,” Juba Archbishop Paulino Lukudu Loro told Catholic News Service. “He said, ‘Southerners, you voted for independence, so leave.’ Our students couldn’t learn there, they were being harassed, and al-Bashir was conscripting them and sending them to his wars, so the seminary was forced to come back to Juba. “Thank God this happened in April, when our students were on holiday, and many were already back home in the South,” he told Catholic News Service. To make room for the theology students in Juba, scores of seminarians enrolled in philosophy courses have been sent packing. This comes after a Vatican emissary, Bishop Peter Kihara Kariuki of Marsabit, Kenya, came to Sudan and South Sudan earlier this year and gave the seminary a failing grade in its orientation of young priests and the quality of its academic program. Many South Sudanese spent years in exile or surviving in the bush, so the quality of their education is uneven. And the new country’s decision to make English the official language, including in the schools, has made the transition difficult for citizens speaking only Arabic and tribal languages. “It was found that students were completely unprepared to be seminarians. Some didn’t even know how to make the sign of the cross. Rome was going to close the seminary entirely, but we struggled to keep at least the theology course open,” the archbishop said. Rome finally agreed to let theology classes continue, while the bishops accepted that philosophy students will return to the dioceses, where each bishop will make provisions for their formation. In many cases, however, no good alternatives have been found. “My diocese is one of the most affected. I have 48 students in philosophy, and to just leave them on the streets is painful. We are looking for a way out,” said Bishop Eduardo Hiiboro Kussala of Tombura-Yambio. “I met with the bishops’ conference of Kenya, but they said they didn’t have space. Their seminaries are full. Uganda is the same. Some missionaries who have these kind of schools also don’t have space or are too expensive,” Bishop Kussala said. The bishops’ conference is negotiating with European donors to come up with the funds to expand seminary facilities in Juba, hoping that within two to three years they can resume both philosophy and theology classes there. Yet, Bishop Hiiboro says that’s too long. “It’s not a good decision. We are going to pay heavily for this. Because after two or more years, if we can’t keep the young men longer, they may run away,” he said. Michael Dakpari is one of those young men. A former refugee in neighboring Congo, the 23-year-old got his high school certificate in March. He was accepted into seminary training in Bishop Hiiboro’s diocese, but now he has been told to hold on. Since its founding by Comboni missionaries in Yei in 1956, the seminary has moved several times. After being moved to Juba in 1964 when foreign missionaries were expelled, the students didn’t have long until they moved again. Father Caesar Lukudu Jombi, then a student in the seminary, recalls having to leave in a hurry in 1965. “Juba was burned one night, and the bishop of Wau came the next day to tell us to leave for Zaire. We said we didn’t speak French, so he told us to head for Uganda. Each student received two kilos of rice and sugar and was told to pack two shirts, two trousers and two sheets. We started walking that afternoon, leaving our dinner cooking on the fire. We just walked away, all of us, until nine days later we got to Koboko in Uganda, where the bishop of Gulu sent buses to pick us up,” said Father Lukudu. As war ebbed and flowed in the following decades, the seminary moved eight times. Father Lukudu, who became the seminary’s rector in 1976 and later served as rector of the Catholic University of East Africa in Nairobi, Kenya, said the school has the same narrative as the people of South Sudan. “It’s a walking seminary, like St. Paul, who went on a journey. Our seminary has also been on a journey, evangelizing along the way,” he said. Given the seminary’s shortcomings in recent years, archdiocesan officials in Juba have also asked for help from Solidarity With South Sudan, an international network of religious orders and congregations supporting the church in South Sudan with medical, educational and pastoral training. The archdiocese wants Solidarity to devise a program to accompany new priests during their first five years after ordination. Claretian Father Callistus Joseph of Sri Lanka, who coordinates the main Solidarity office in Juba, said the group’s pastoral team has been listening to church leaders and young priests and is currently developing a curriculum for the program. “There are similar programs in many religious congregations that could be used as a framework, but South Sudan is very peculiar and unique. Some of the issues that young priests deal with here are elsewhere dealt with in seminary,” said Father Joseph. The program will focus on helping young priests find strength in themselves to deal with challenges that arise in pastoral practice. “If they can better understand the deeper meaning of their call to ministry, then they may persevere in the priesthood,” said Father Joseph.